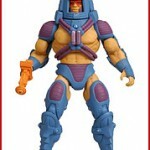 Matty Collector has announced the poll results for the upcoming MOTU Classics figure Man-E-Faces. “Recently, we ran a poll on the color of the upcoming Man-E-Faces® figure. 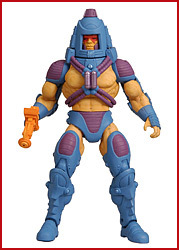 What had happened was that The Four Horsemen wanted to do Man-E-Faces® with his mini-comic colors (flesh tone), Toy Guru wanted to do a full orange suit version, and a half-and-half version was shown at New York Toy Fair. Still, an agreement couldn’t be reached amongst the team so we figured we’d let the fans decide. And what did you choose? “Man-E-Faces® figure has a bit of a deco dilemma. The original cross-sell image of the toy on the back of the package showed Man-E-Faces® with flesh-toned skin with blue armor. But the original toy didn’t match this and shipped with orange skin, which most fans have interpreted over the years as an orange skintight suit (much like Man-At-Arms® wears a green skintight suit). We checked with some of the original Mattel designers and indeed the orange color on the vintage figure was intended to be flesh-toned, but back in the day, our partners in China had a hard time matching the tone and he came out orange!